Delhi's air quality continued to improve on Sunday with the pollution level coming down to 'poor' category after oscillating between 'very poor' and 'severe' for nearly three weeks, authorities said. The overall Air Quality Index was recorded at 231 on Sunday which falls in 'poor' category. On Friday, the AQI was recorded at 370, which came down to 336 on Saturday, according to data of the Central Pollution Control Board. On Sunday, the PM2.5 (particles in the air with a diameter of less than 2.5 micrometres) level was recorded at 106, while the PM10 (particles in the air with a diameter of less than 10 micrometres) was recorded at 198. An AQI between 0 and 50 is considered 'good', 51 and 100 'satisfactory', 101 and 200 'moderate', 201 and 300 'poor', 301 and 400 'very poor' and 401 and 500 'severe'. Authorities have attributed the improvement in air quality to control measures and meteorological conditions but they have also warned of deterioration of air quality to 'severe' levels from Monday. There is a halt on all construction activities involving excavation. Civil construction has also been suspended in Delhi and other NCR districts, besides closure of all stone crushers and hot mix plants generating dust pollution. The Delhi Pollution Control Committee has also directed the Transport Department and the Traffic Police to intensify checking of polluting vehicles and control travel congestion in the region during November 1-10. A total penalty of Rs 80 lakh was imposed on violators on Friday and Saturday by the teams deployed to monitor implementation of measures to combat pollution in Delhi-NCR under the campaign. 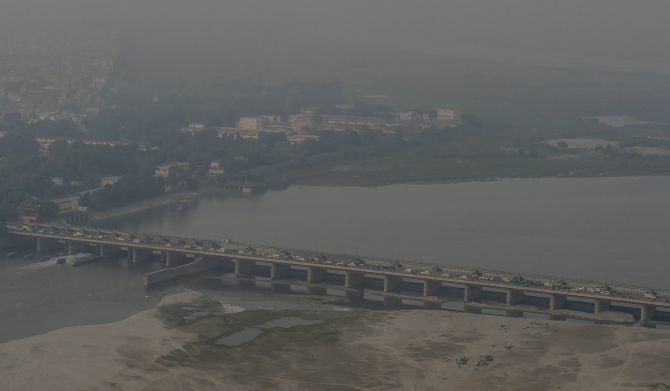 Based on 465 complaints, a total fine of Rs 41,82,500 was imposed on Saturday itself by 52 teams in the national capital, which has witnessed deteriorating air quality in the past two weeks, the Central Pollution Control Board said. The highest number of complaints were related to illegal construction and demolition activities, the CPCB said. On Friday, a total of 576 complaints were received and a fine of Rs 38,68,500 was imposed, the CPCB said. With Delhi's air quality expected to deteriorate further post Diwali, several schools have started taking precautionary measures. Amita Wattal, principal of Springdales, Pusa Road in Delhi, said the school is organising campaigns to make students aware of the hazards due to fire crackers ahead of Diwali.